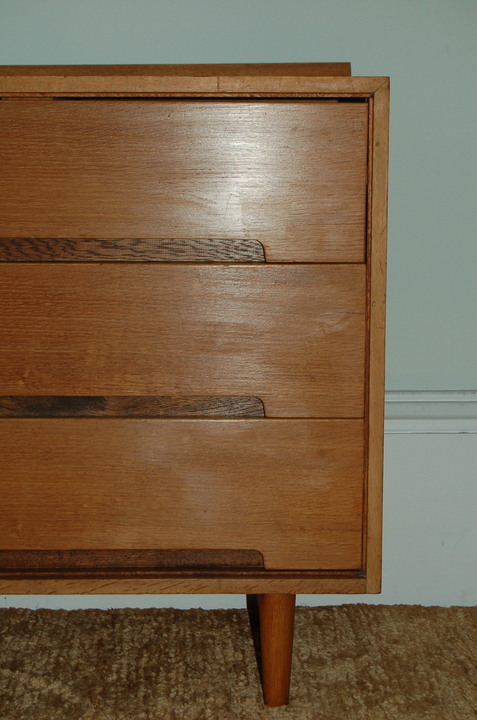 'C' range chest of drawers, designed by John and Sylvia Reid, for Stag Furniture UK. 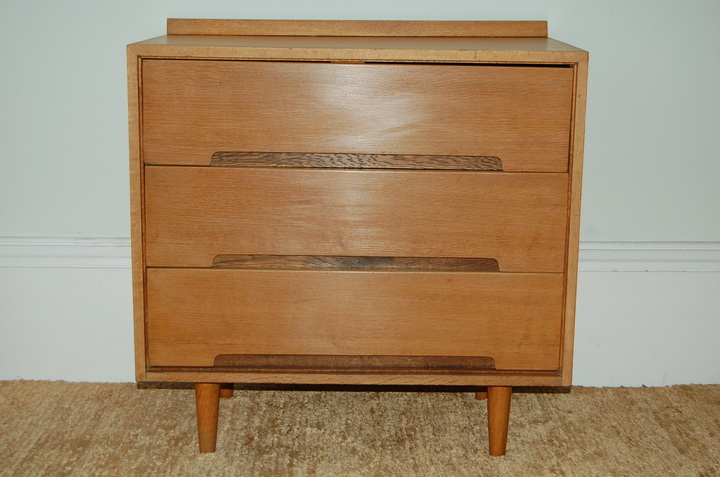 Oak veneered carcass on turned legs with three deep drawers featuring recessed handles. 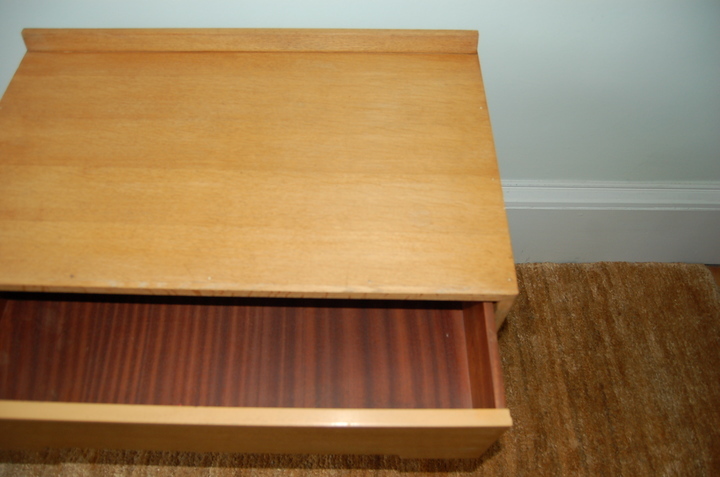 A classic piece of British mid-century design, offering the perfect solution for compact modern living. British design duo John and Sylvia Reid designed the the Cumberland or 'C' range in 1953, their first furniture line for Stag. The 'C' range eventually proved a great success at the time and has become an iconic piece of post-war British furniture design. An impressive addition to any mid-century or contemporary interior. British design duo John and Sylvia Reid designed the the Cumberland or 'C' range in 1953, their first furniture line for Stag. The 'C' range eventually proved a great success at the time and has become an iconic piece of post-war British furniture design. An impressive addition to any mid-century or contemporary interior. John and Sylvia Reid's new range of bedroom furniture, called Cumberland, took functionalist principles to their logical conclusion and resulted in a range of furniture that was cheap to mass produce, but was of high quality. There was no pretence that this new furniture was handmade by craftsmen; it was built by machine and was meant to look like it. The original range was just one bedroom suite: a 3 ft wardrobe, a three-drawer chest and four-drawer chest with a mirror to allow either chest to be used as a dressing table. The units were stark in the extreme. 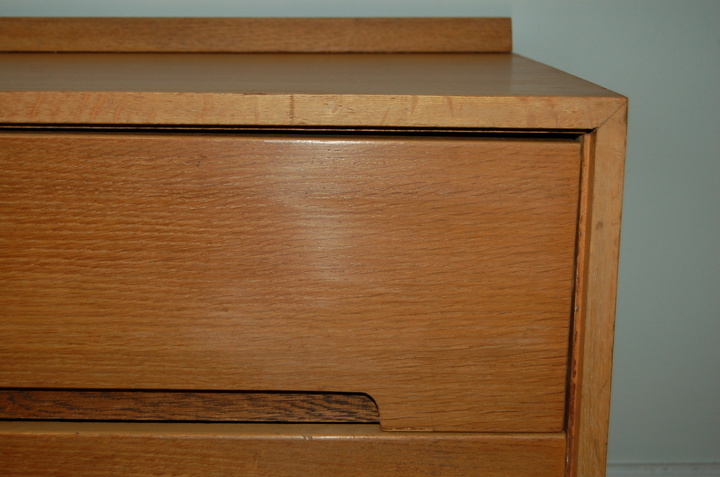 There were no handles; the drawers and doors had recessed hand grips instead. All were straight sided boxes. The wardrobe was simply decorated with a plain mirror only nine inches wide placed to the left hand side. However, it was good enough for its purpose. Stag advertised it as for 'the young in heart and in pocket' and for a design of this quality, it was amazingly cheap. Stag's Chairman, Vaughn Radford, was not impressed with Cumberland. He thought it would never sell. His two sons, however, loved it. At first, Vaughn was right. Sales were slow; no more than £5,000 in the first year. It took a while for people to accept such a stark design. However, interest in the range grew dramatically and by 1957 it was earning more than £500,000 a year for Stag. As well as being a commercial success, the 'C' range had a strong influence on the design of mass market modern furniture throughout the fifties.